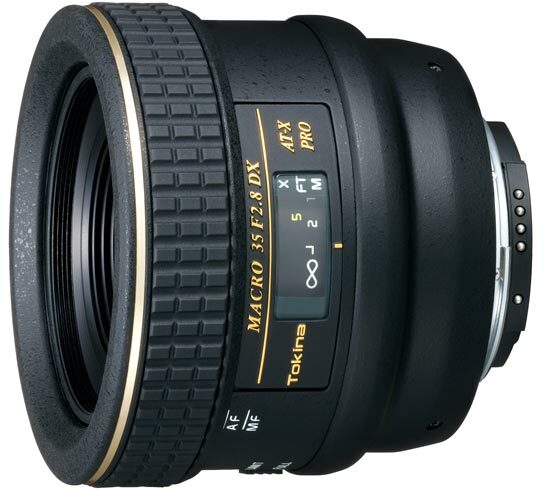 This is a prime lens manufactured by Tokina and the model was launched 2007. The lens has a focal length of 35 mm. Since the lens is designed to be used on a camera with smaller sensor ('APS-C') the focal length will be equivalent to 56 mm if you have a Canon camera or 52 mm if you have a Niko camera. The lens has a traditional filter thread on the front and its measuring 52 mm which also the filter you will use must have. If you use for example an UV filter can be a cheap insurance against scratches and dust. If you buy this lens it will come with a lens hood, whose model name is "MH522". Text from Tokina: "When used on digital SLR cameras the AT-X M35 PRO DX lens gives the same angle of view as a 52mm lens. The close focusing distance of the M35 is an amazingly close 5.5 in. (14cm) yielding a macro ratio of 1:1 or life-sized reproduction with excellent sharpness. Its compact size makes it easy to carry almost everywhere and the wide f/2.8 aperture allows for easier viewing in low light situations. Tokina’s exclusive One-touch Focus Clutch Mechanism allows the photographer to switch between AF and MF simply by snapping the focus ring forward for AF and back toward the camera to focus manually. There is no need to change the AF-MF switch on Nikon cameras*** and there is no second AF/MF switch on the lens for Canon, everything is accomplished by the focus ring. "